Dylan Voller today answered “no comment” to a question from the Alice Springs News Online whether he had drawn up a kill list. National media have reported that a hand-written list, allegedly written by Mr Voller and submitted to the Royal Commission into the Protection and Detention of Children in the Northern Territory, had been leaked. The list shown had six names on it. According to the Australian Newspaper, the list was entitled “People to Kill”, and the piece of paper includes “run him over”, “slice his throat” and “stab him in the neck” as ways to allegedly bring about the deaths of the people named. “Drop a 50kg weight on his head” and “stab him with a pencil” are also mentioned, says the Australian. 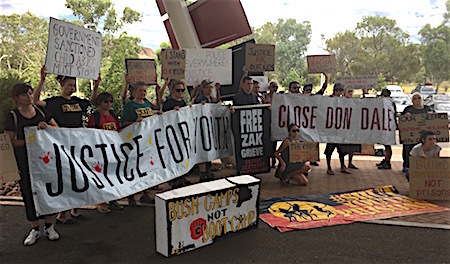 At noon today Mr Voller (in the centre of the photo above) took part in a demonstration of about 20 people, including his mother, in Alice Springs where the commission is sitting for three days. He said he is “going good” at Bushmob, a diversionary program for young people in conflict with the law. I see his sister was there, I wonder if she attended her appointment at the magistrates court today? [ED – According to the court list, VOLLER Kirra was summonsed to appear in the local criminal court on March 13 at 10am for a plea or mention on three charges: Drive a motor vehicle while unlicensed; drive unregistered motor vehicle; drive uninsured motor vehicle. It is great Dylan wants to turn his life around. Unless I missed something Dylan and his offsiders are pretty vocal. With respect, I ask where his offsiders were when he was being charged with [serious crimes]? He needed you then? I haven’t heard his apologies. Sure, he might have been roughly treated but so were his victims. Some of his victims maybe suffering PTSD and other disorders as a direct result of his crime. Dylan, keep out of the media and reflect on what you have done and stop playing the victim. You got no more than what you dished out. Start a business and donate your profits to victims of crime. The irony is that the only one who will be ultimately be compensated is you? Desert Rat, no need to go to an extreme, all that is asked is to treat people with respect, not unnecessary violence when in detention. Reading some comments I have the impression that some people wish the rehabilitation of Dylan to fail. His actions remain wrong, with no excuses, but give the kid a go. I do remember Giles House, the inmates were treated with respect and taken to highschool in a police van and put into the care of understanding teachers. The transfer to Darwin in my eyes was a total fiasco. Let him that is without sin cast the first stone. Who has never said in frustration: “On of those day I will kill you”? Only those who are faultless have the right to pass judgment on others. I’m pretty sure that there is less support for him than he imagines. Interesting: 20 people out of 26,000 says more about you than any amount of self promoting propaganda. But your handwritten death list [should it be proven to exist, would speak] volumes of your character and the gullibility of those that support you.